Last Saturday, April 6, the Tritons traveled up to Turlock to face California State University, Stanislaus in a four-game series. Despite a losing record (12–14), Stanislaus took both games in a doubleheader on Sunday which pushed UC San Diego back to having a small half-game lead in the California Collegiate Athletic Association, as the Tritons are now sitting on an 18–7 record in CCAA, and a 23–7 record overall. The Tritons kicked off the series with success defeating the Warriors 5–1. UCSD’s pitchers continued their dominance as junior Ted Stuka (5 innings pitched, 3 hits, 1 run), and junior Luke Mattson (4 innings, 2 hits, 0 runs), threw it right by Stanislaus bats all game long. Leadoff man and sophomore shortstop Shay Whitcomb got things going for the Tritons in the first inning with a double and stayed hot throughout boasting a 3–6 day at the plate. Freshman designated hitter Michael Furhman and senior right fielder RJ Prince also contributed with 2 hits apiece and accounting for 3 of the team’s 5 runs. With the win, Stuka moves to 5-1 on the year and now has the lowest ERA in the CCAA (with a minimum of 36 innings pitched). After a strong showing in game one, the Tritons dropped two games back-to-back in the doubleheader on Sunday 4–2 and 7–3 (7 innings). In the first Sunday game, the Tritons had their work cut out for them offensively as they found themselves behind, 3–1, in the 3rd inning. Despite senior starting pitcher Preston Mott carrying the load on the mound (6 innings, 1 run, 12 strikeouts), the offense couldn’t put together enough runs to climb back into the game, and ultimately lost 4–2. Warriors’ third baseman Grant Victor helped lead his team to victory with a 2-run homer that proved to be the difference. In the second Sunday game, slated for 7 innings, both teams got off to slow starts until the third inning, when Stanislaus State put up 7 runs, on 5 hits and an error, off sophomore pitcher Noah Conlon. With just 4 innings left in the game to surmount this disadvantage, the Tritons eventually lost although they put together a strong final inning, scoring 3 runs in the 7th inning thanks to a 2 RBI pinch-hit single from senior outfielder Chris Schasteen. Stanislaus State’s starting pitcher nearly lasted the entire game, pitching 6.2 innings while only giving up two runs in his last inning of work. With one game left in the series, on Monday, April 8 the Tritons started undefeated junior Brandon Weed, to the mound to try to split the series. After some fireworks in the previous game, this one came down to the wire with UCSD winning 4–3. The Tritons took control of the game in the 4th inning after singles from Furhman and redshirt sophomore Blake Baumgartner kicked off the inning and resulted in 2 runs, and a 2-1 lead. In the next two innings, the Tritons would add on to their lead with quality at-bats from Whitcomb and redshirt sophomore catcher Aaron Kim, and an error on Stanislaus State, which would make the score 4–2 heading into the 7th inning. Despite tacking on a run in the 8th inning, the Warriors were unable to overcome the deficit and in the end lost by a score of 4–3, with senior UCSD reliever Kyle Lucke picking up a 3-inning save, his 4th of the year. Whitcomb and Baumgartner put together solid days at the plate, both managing two hits which push their batting averages to .322 and .333, respectively, on the season. Over the course of the next month, No. 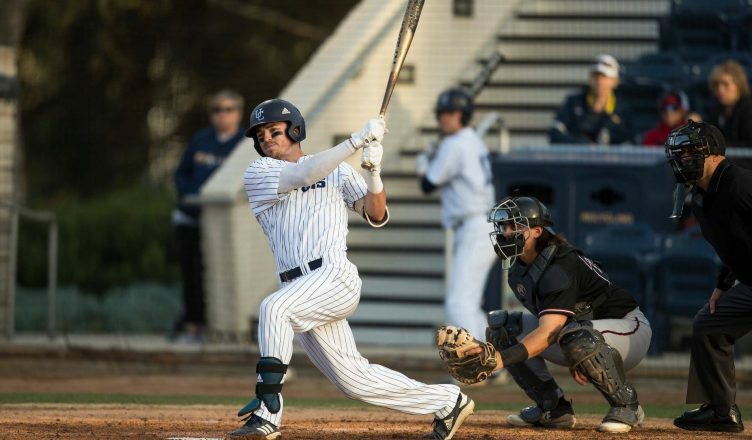 10 UCSD will have to prove its road dominance as it will not have any more regular season game at Triton Ballpark. With the postseason just around the corner, the Tritons will look to increase their CCAA lead without the comforts of Triton Ballpark, as they play 8 of their final 12 games on the road.